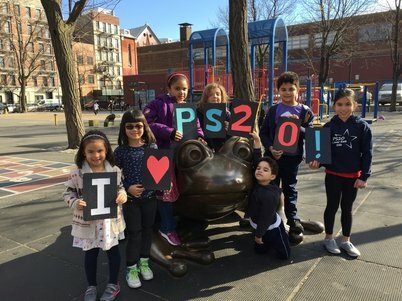 Be a Sponsor or a Partner at PS20! PS 20 is an elementary school in the Lower East Side and has been a neighborhood institution for generations. 1. Sponsor one of our events held to engage our families and enrich the student learning experience. 2. Partner with our school and be a positive influence. Be a community member on one of our committees: Wellness Council, Cultural Diversity, Fundraising, or Community/Alumni Outreach. 3. Donate Items such as gift certificates, goods, services or promotional items to our events, committees, and arts/music/technology/library classes. Take part in our Coupon Book. 5. Donate Money. Cash, checks and credit cards are accepted. Donate online NOW. Alternatively, you can download and complete this ﻿﻿﻿donation form﻿﻿﻿.. Return the form and payment by mail, email, or give it to the friendly PS20 representative who presented this form to you. Please keep a copy for your records. For your donation and partnership, PS20 will list you as a local community partner on our website. Please email an electronic business logo to ps20mPTA@gmail.com. Our website is www.ps20m.org. Your contribution is a direct investment in your child’s education and your community. This website was created and is maintained by the PS20 PTA. The content is intended for parents, prospective parents and other visitors over 13 years of age.